"I'm like the leaves, the wind blows me around, wolves die alone"
The Croatian Final was held on March 5th at the HRT TV Studios in Zagreb, hosted by Duko Curlic & Robert Ferlin. Before the final there were two semi-finals - click here for details: CROATIAN SEMI-FINALS 2005 The winner was chosen in two rounds - in the first round the top 3 were chosen by televoting (50%) & an "expert" jury (50%). In the second round the winner was chosen by televoting. Boris Novkovic previously came 2nd in the 1990 Yugoslav Final, equal 7th in the 1994 Croatian Final, 6th in 1995, 11th in 2000 & 3rd in 2002. At the ESC, he was 11th. Vesna Pisarovic represented Croatia in ESC 2002. 4 asa included Vlado Kalember who represented Yugoslavia in ESC 1984 & Rajko Dujmic who was a member of the group 'Novi Fosili' that represented Yugoslavia in 1987. 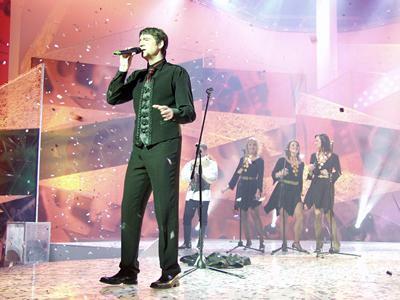 Goran Karan represented Croatia in ESC 2000. Danijela represented Croatia in ESC 1995 ESC as lead singer of Magazin & in 1998. Magazin represented Croatia in ESC 1995.